Stories of bloody, degrading violence associated with Canadian mining operations abroad sporadically land on Canadian news pages. HudBay Minerals, Goldcorp, Barrick Gold, Nevsun and Tahoe Resources are some of the bigger corporate names associated with this activity. Sometimes our attention is held for a moment, sometimes at a stretch. It usually depends on what solidarity networks and under-resourced support groups can sustain in their attempts to raise the issues and amplify the voices of those affected by one of Canada’s most globalized industries. But even they only tell us part of the story, as Todd Gordon and Jeffery Webber make painfully clear in their new book, The Blood of Extraction: Canadian Imperialism in Latin America (Fernwood Publishing, November 2016). Fortunately, the book is careful, as it must be in a region rich with creative community resistance and social movement organizing, not to present people as mere victims. Rather, by providing important context to the political economy in each country studied, and illustrating the truly vigorous social organization that this destructive development model has awoken, the authors are able to demonstrate the “dialectic of expansion and resistance.” With care, they also show how Canadian tactics become differentiated to capitalize on relations with governing regimes considered friendly to Canadian interests or to try to contain changes taking place in countries where the model of “militarized neoliberalism” is in dispute. Cumulative CDIA in the region jumped from $2.58 billion in stock in 1990 to $59.4 billion in 2013. These numbers are considerably underestimated, the authors note, since they do not include Canadian capital routed through tax havens. In comparison, U.S. direct investment in the region increased proportionately about a quarter as much over the same period. Despite having an economy one-tenth the size of the U.S., Canadian investment in Latin America and the Caribbean is about a quarter the value of U.S. investment, and most of it is in mining and banking. To cite a few of the statistics from Gordon and Webber’s book, Latin America and the Caribbean now account for over half of Canadian mining assets abroad (worth $72.4 billion in 2014). Whereas Canadian companies operated two mines in the region in 1990, as of 2012 there were 80, with 48 more in stages of advanced development. In 2014, Northern Miner claimed that 62% of all producing mines in the region were owned by a company headquartered in Canada. This does not take into consideration that 90% of the mining companies listed on Canadian stock exchanges do not actually operate any mine, but rather focus their efforts on speculating on possible mineral finds. This means that, even if a mine is eventually controlled by another source of private capital, Canadian companies are very frequently the first face a community will see in the early stages of a mining project. The results have been phenomenal “super-profits” for private companies like Barrick Gold, Goldcorp and Yamana, who netted a combined $2.8-billion windfall in 2012 from their operating mines, according to the authors. (Canadian mining companies earned a total of $19.3 billion that year.) Between 1998 and 2013, the authors calculate that these three companies averaged a 45% rate of profit on their operating mines when the Canadian economy’s average rate of profit was 11.8%. Compare this to Canada’s miserly Latin American development aid expenditures of $187.7 million in in 2012—a good portion of this destined for training, infrastructure and legislative reform programs intended to support the Canadian mining sector. Or consider that the same year $2.8 billion was taken out of Latin America by three Canadian mining firms, remittances back to the region from migrants living in Canada totalled only $798 million (much more than Canadian aid). Without spelling out the long-term social and environmental costs of these operations—costs that are externalized onto affected communities—or going into the problematic ways that private investment and Canadian aid can be used to condition local support for a mine project, Gordon and Webber posit that “super-profits” may be precisely the “Canadian interests” the government’s foreign policy apparatus is set up to defend—not authentic community development, lasting quality jobs or a reliable macroeconomic model. The extractive model of capitalism maturing in the Latin American context today does not only involve the imposition of a logic of accumulation by dispossession, pollution of the environment, reassertion of power of the region by multinational capital, and new forms of dependency. It also, necessarily and systematically involved what we call militarized neoliberalism: violence, fraud, corruption, and authoritarian practices on the part of militaries and security forces. In Latin America, this has involved murder, death threats, assaults and arbitrary detention against opponents of resource extraction. The rapid and widespread granting of mining concessions across large swaths of territory (20% of landmass in some countries), regardless of who lives there or how they might value different lands, water or territory, has provoked hundreds of conflicts and powerful resistance from the community level upward. In reaction, and in order to guarantee foreign investment, in many parts of the region states have intensified the demonization and criminalization of land- and environment-defenders, while state armed forces have increased their powers, and para-state armed forces expanded their territorial control. Far from being a countervailing force to this trend, the Canadian state has focused its aid, trade and diplomacy on those countries most aligned with its economic interests. It is not unusual to see public gestures of friendship or allegiance toward governments “that share [Canada’s] flexible attitude towards the protection of human rights,” such as Mexico, post-coup Honduras, Guatemala and Colombia. Meanwhile, Canada has used diverse tactics (in Venezuela and Ecuador, for example) to contain resistance and influence even modest reforms. One of the more detailed examples in Blood of Extraction of Canadian imperialism in Central America covers Canada’s role in Honduras following the military-backed coup in June 2009. Documents obtained from access to information requests provide new revelations and new clarity into how Canadian authorities tried to take advantage of the political opportunities afforded by the coup to push forward measures that favour big business. Once again, though other economic sectors are discussed, mining takes centre stage. After the terrible experience of affected communities with Goldcorp’s San Martin mine (from the year 2000 onward), Hondurans successfully put a moratorium on all new mining permits pending legal reforms promised by former president José Manuel Zelaya. On the eve of the 2009 coup, a legislative proposal was awaiting debate that would have banned open-pit mining and the use of certain toxic substances in mineral processing, while also making community consent binding on whether or not mining could take place at all. The debate never happened. In a highly authoritarian and repressive context, and under the deceptive banner of corporate social responsibility, the Canadian Embassy—with support from Canadian ministerial visits, a Honduran delegation to the annual meeting of the Prospectors & Developers Association of Canada (PDAC), and overseas development aid to pay for technical support—managed to get the desired law passed in early 2013, lifting the moratorium. Then, in June 2014, with full support from Liberals and Conservatives in the House of Commons and the Senate, Canada ratified a free trade agreement with Honduras, effectively declaring that “Honduras, despite its political problems, is a legitimate destination for foreign capital,” write Gordon and Webber. Contrary to the prevailing theory in Canada that sustaining and increasing economic and political engagement with such a country will lead to improved human rights, the social and economic indicators in Honduras have gotten worse. Since 2010, the authors note, Honduras has the worst income distribution of any country in Latin America (it is the most unequal region in the world). Poverty and extreme poverty rates are up by 13.2% and 26.3%, respectively, after having fallen under Zelaya by 7.7% and 20.9%. Compounding this, Honduras is now the deadliest place to fight for Indigenous autonomy, land, the environment, the rule of law, or just about any other social good. In the chapter on Ecuador, Gordon and Webber provide a detailed account of Canada’s “whole-of-government” approach to containing modest reforms advanced by Correa and undermining the opposition of affected communities and social movements to opening the country to large-scale mining. 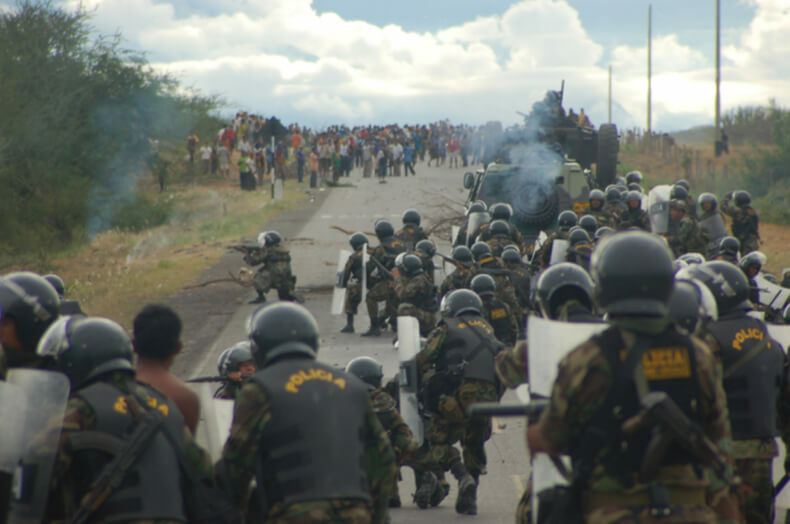 A critical moment in this process occurred in mid-2008, when a constitutional-level decree was issued in response to local and national mobilizations against mining. The Mining Mandate would have extinguished most or all of the mining concessions that had been granted in the country without prior consultation with affected communities, or that overlapped with water supplies or protected areas, among other criteria. It also set in place a short timeline for the development of a new mining law. The Canadian embassy immediately went to work. Meetings between Canadian industry and Ecuadorian officials, including the president, were set up to ensure a privileged seat at talks over the new mining law. Gordon and Webber’s review of documents obtained under access to information requests further reveals that the embassy even helped organize pro-mining demonstrations together with industry and the Ecuadorian government. Embassy records describe their intention “to create sympathy and support from the people” as part of a “a pro-image campaign,” which included “an aggressive advertisement campaign, in favour of the development of mining in Ecuador.” Meanwhile, behind closed doors, industry threatened to bring international arbitration against Ecuador under a Canada–Ecuador investor protection agreement (which a couple of investors eventually did). Ultimately, the authors conclude, Canadian diplomacy “played no small part” in ensuring that the Mining Mandate was never applied to most Canadian-owned projects, and that a relatively acceptable new mining law was passed in early 2009. While embassy documents show the Canadian government considered the law useful enough to “open the sector to commercial mining,” it was still not business-friendly enough, particularly because of the higher rents the state hoped to reap from the sector. As a result, the embassy kept up the pressure, including using the threat of withholding badly needed funds for infrastructure projects until mining company concerns were addressed and dialogue opened up with all Canadian companies. Not discussed in The Blood of Extraction, we also know the pressure from Canadian industry continued for many more years, eventually achieving reforms, in 2013, that weakened environmental requirements and the tax and royalty regime in Ecuador. Meanwhile, as the door opened to the mining industry, mining-affected communities and supporting organizations were feeling the walls of political and social organizing space cave in, as they faced persistent legal persecution and demonization from the state itself, while the serious negative impacts of the country’s first open-pit copper mine started to be felt. The problem is not Goldcorp or HudBay Minerals, Tahoe Resources or Nevsun. These companies are all symptoms of a system on overdrive, fuelling the overexploitation of land, communities, workers and nature to fill the pockets of a small transnational elite based principally in the Global North. If we cannot see how deeply enmeshed Canadian capital is with the Canadian state—how “Canadian interests” are considered met when Canadian-based companies are making super-profits, even through violent destruction—we cannot get a sense of how thoroughly things need to change. Jen Moore is the Latin America Program Co-ordinator at Mining Watch Canada, working to support communities, organizations and networks in the region struggling with mining conflicts. This article was first published in the November/December 2016 issue of The Monitor, a publication of The Canadian Centre for Policy Alternatives. Click here for more or to download the whole issue.